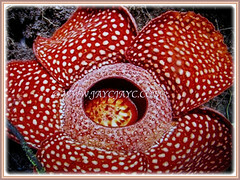 Botanical Name: Rafflesia arnoldii (syn. : Rafflesia titan. Common Names: Corpse Lily, Corpse Flower, Bunga Bangkai in Indonesian Language. Etymology: The generic name Rafflesia, given in honour of Raffles and proposed by Brown, who had originally wanted to call it Arnoldii after Arnold. Origin: Native to the rainforest of Sumatra and possibly Borneo. Plant type: It is an exotic and rare flower. 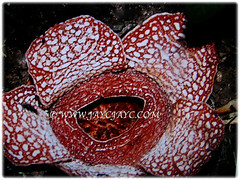 Features: Rafflesia arnoldii is from the genus, Rafflesia that consists of 13 species. Rafflesia is a huge speckled five-petaled flower with a diameter up to 1 m and weighing up to 10 kg. A rare, parasitic, rootless and leafless plant, Rafflesia arnoldii has been noted as the largest known flower in the world. 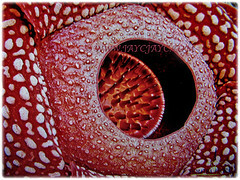 Rafflesia flower has a small life span of 5-7 days. Rafflesias have their stamens and pistils fused together in a central column, producing a corona or crown in the shape of a ring. The flowers are up to 1 m in diameter and their reddish-brown petals are sprinkled with white freckles. Each flower is either male or female and consists of five lobes inserted on a cup-like structure. In the centre of the cup is a column with a disk. Flowers emerge from very large, cabbage-like, maroon or magenta buds up to 30 cm wide. The anthers (male parts) or styles (female parts) are situated underneath the disk. The fruits are berries with minute seeds. 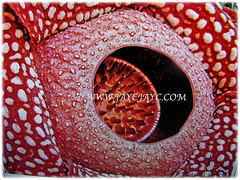 Rafflesia flowers are unisexual. The smell attracts the carrion flies and then pollination occurs. After 9 months of maturation, Rafflesia plant opens into a cabbage-sized bud. The sexual organs are located beneath the rim of the disk. Forest mammals and tree shrews feed on Rafflesia fruit which is 15 cm in diameter, filled with smooth flesh and thousands of tiny hard coated seeds. Rafflesia is the largest individual flower in the world. Rafflesia is a parasite which attaches itself to a host plant, Tetrastigma vine which grows only in undisturbed rainforests, to obtain water and nutrients. 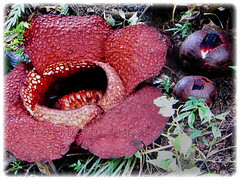 Forest mammals and tree feed on Rafflesia fruits which is 15 cm in diameter and filled with smooth flesh and thousands of tiny hard coated seeds. The rotten smell of the flower is due to the reddish tentacle-like, branched ramentae, inside the corolla of petals. This plant produces no leaves, stems or roots and does not have chlorophyll. 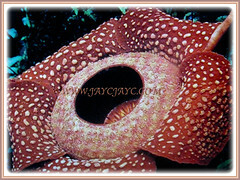 Culture (Care): Rafflesia arnoldii or Corpse Lily grows easily with the least maintenance. Soil: Humus-enriched and moist soils. Others: Generally free from serious garden pests and diseases. Propagation: Birds and squirrels enjoy eating the fruit and help to spread the Rafflesia seeds through their eliminations. 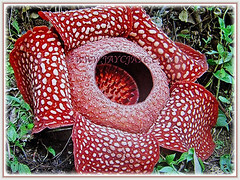 Usage: The flower buds of Rafflesia arnoldii or Corpse Lily are applied in traditional medicine to promote delivery and recovery during and after childbirth. They are also used as an aphrodisiac. It is likely that these uses are associated with the shape, colour and size of the buds, and superstitions surrounding the flower rather than being linked to any chemical properties. It contains thousands of seeds. Birds and squirrels enjoy eating the fruit and help to spread the Rafflesia seeds through their eliminations.